Above is a picture of my hare collection. I love all animals but hares rock because I am an Aries and like most people I feel energised when the Spring returns. Why are hares a symbol of Spring? A congregation of hares is called a “drove”. They tend to gather is around now, the time of the Spring Equinox. It is like carnival time as they run and leap through meadows at fast speeds. This is where the term “mad as a March hare” comes from. They are known for boxing matches as well and although it is assumed that, like stags etc, it is about establishing who are the dominant males, in fact, it is often male versus female !! Perhaps it is an interview process whereby she can work out if he is suitable to sire children or if he is just a big hare girl’s blouse. What could be a better symbol of equality of the sexes at the time of balance, the Spring Equinox than a male and female squaring up to each other? In the picture above there is a moon struck hare. They do tend to come out at night (more links to the “mad March hare” lunatic link) so we associate them with the lunar. The gestation period of the hare is 40 days which is close to the lunar cycle of 28 to 30 days. Hares could conceivably (did you like that pun?) give birth once a month. It is interesting that the human gestation period is 40 weeks. There are 40 days in Lent too. I love looking at numbers and their associations. Even Moses received the design of the tabernacle and the two stone tablets detailing the law while on Mount Sinai for 40 days. I thought I would look at Ancient Egypt to see if the hare was sacred to them and it was. The Goddess Wenet was depicted either as a hare, or as a woman with a standard bearing a recumbent hare on her head, or even as a woman with the head of a hare. Plutarch maintained that the Ancient Egyptians venerated the hare due to its swiftness and keen senses, but the hare’s form was also taken by certain other deities who had associations with the Otherworld. The hare was often depicted as a messenger for Thoth. Interestingly hare was shown greeting the dawn in ancient Egyptian mythology and art, in common with the baboon.The latter in nature has been shown from ancient times as patiently seated awaiting the sun to rise over the horizon at dawn. The Cape Hare, which is the hare that is sacred to Wenet, has a distinctive yellow chest and white abdomen. That could be why this became associated with greeting the sun at dawn. There were amulets found in tombs and tomb paintings depicting the Cape Hare. This species is included under the scientific name of Lepus capensis, with the European Hare and Brown Hare. Lepus capensis is the animal upon which the Easter Bunny is based. I found these delightful dedication to Wenet and thought that it is a very apt piece to celebrate the hare at Spring Equinox. This is the time when darkness and light are poised in balance and then the light wins and the days become longer. We equate the polarity of light and darkness with the Conscious and Unconscious mind. We become more outgoing during the longer, lighter days and our thoughts turn outwards for stimulation rather than turning inwards. The line that caught my attention was that the Goddess holds two jars, the black and the white. Black and white, the duality, polarity of light and dark, one in each hand. This is a perfect depiction of the Equinox. I will leave you to savour this poem. 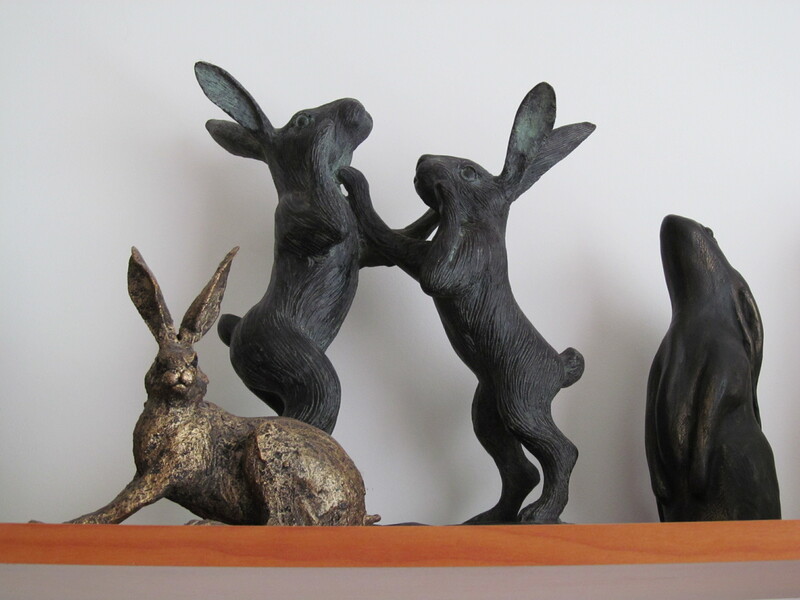 May there be a Spring in your step, may you feel energised and playful like the hare. The sap is rising, light is victorious, attune yourself to the freshness of Spring. If you get the opportunity take a little break from the everyday routine and visit a field or forest and leap and run for a short (or longer) distance. Have a good hare day! Your Beauty enfolds my soul. And the Adze of the South. To all who seek You. Sacred Words long unspoken rush forth from my lips. Divine Light quivers and bursts from my being. This entry was posted in Ancient Egypt, Dreams, Language and The Unconscious, Environment and tagged easter bunny, Hare, Polaity, Spring Equinox, Wenet Hare Goddess. Bookmark the permalink.